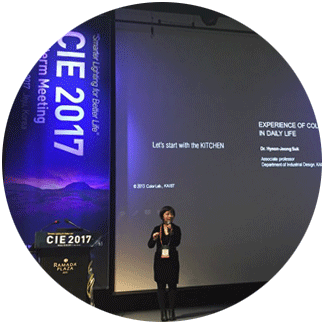 Prof. Suk delivered a keynote speech at CIE2017, Jeju. She talked about users’ experience of colored lighting in daily lives that focused how we could enrich our every day lives through nuanced lighting. The CIE stands for the International Commission on Illumination – also known as the CIE from its French title, the Commission Internationale de l´Eclairage – is an academic and professional society that is devoted to worldwide cooperation and the exchange of information on all matters relating to the science and art of light and lighting, color and vision, photobiology and image technology (www.cie.co.at). The CIE2017 is an annual international conference of CIE, and the KCIE is the host of this year.